Will get rid of the status field and that can be used to add to svn. Okay. 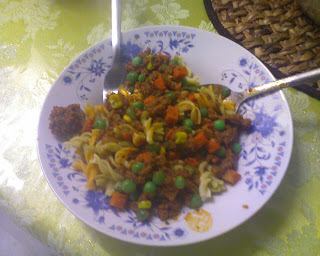 That's the thing I cooked. I have no idea what it's called. At first I was thinking of buying the ribbon ones, then my wife looked at the colorful spiral ones and said "why not get these? 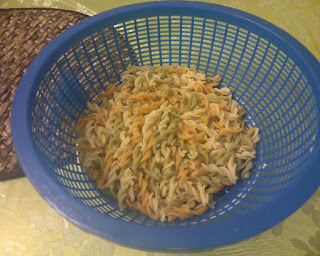 they're more colorful" and so we got them (yes, we know nothing about pasta.. :) So I boiled it, actually put some salt and oil into the water so that they won't stick, drained it and tadaaaaa, you'd get the above. I remember once I tried to cook macaroni and I didn't drain it after boiling it, it filled up the whole pot. LOL... Learned my lesson. Next up the sauce. 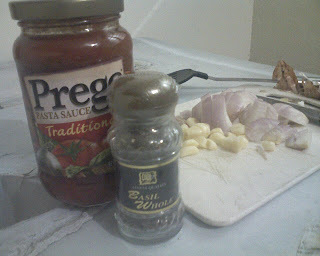 Like I said we don't know anything about pasta so here's the ingredients we prepared. Yes ladies and gentleman. Instant pasta sauce all bottled up and ready to go. Some dried up basil also bottled up. Some onions and garlic. Hahahaha... 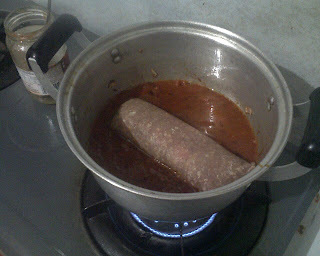 The sauce is "traditional" lagi tu.. So yes, it's about as authentic as I can get it till I learn to do better. So on the color spiral packaging mentioned about frying some onions, garlic and capsicum. Since I didn't have any capsicum, garlic and onions would have to do. So into the frying pot. Once the smell has risen (how DO you say "bau dah naik" in english ?) you can just dump in the sauce. Stir it around a bit. Put water into the bottle and add that to the pot too so that nothing gets wasted. 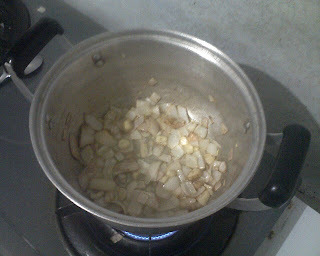 Once it start boiling dump in the minced meat (apologise for my vegetarian or non-cow meat eating readers, the following pic is rather graphical.. :P ). First impression when I just arrived was that the whole atmosphere was so cool. Everyone was friendly and down to earth. There was no special separation between any vip and the other participants or anything. Maybe I've just been to too many government conferences but I love this atmosphere and attitude. The Raj 'Dylan' strumming the "The Times They Are A-Changin' " song on his guitar. To tell the truth there was a few hiccups and most of the audience didn't know the song (yours truly included :P). But I thought it was great. Great for 2 things. One is the fact that "Hey, there's a guy who came forward and played his guitar at this conference.." and two is I find the lyrics very appropriate to how I feel about this conference. The fact that they was able to pull of this conference just shows that the foss community here is getting stronger and better and this could really be the sign of "Times They Are A-Changin'". Yoon Kit gave the opening keynote about the "Format Wars". There wasn't any keynote from APIIT as scheduled. Then it was my talk. Hmmm.. I think it went well despite the slides was just prepared a few hours before the talk. Could have been better if I had prepared earlier but with MyGOSSCON and all that's pretty much the best I could do. There certainly was more interest from the audience than normally from government conferences. Even on Sunday there was still some of the participants come up to me to talk about mymeeting and cakephp. Love it. Hope I stirred up enough interest in MyMeeting to get even more feedback and participation from the community. I better buckle up too and make sure MyMeeting gets better and better all the time. Then it was Google Summer of Code 101 by Raj 'Dylan' Kissu. Awesome talk. Wish I was still a student. I would certainly try my luck in getting into the Google Summer of Code. The opportunity to learn, the money incentive (4500 USD is a lot of incentive ;), the experience in getting involved with Google. After that Kaeru presented the Orca talk because En. Rahim wasn't able to make it. It was great. I stayed awhile for the Navigating the Commons talk but in the middle of it decided I'd rather go to the fosschix session. I missed the main presentation by Pia (until now I still regret it..) but it was great. Just chatting about how to make the working hours more family friendly so that the ladies can get more involved in IT. Love it. Lunch had McChicken. To tell the truth it was nearly enough for me. But I didn't come for the food anyway so I don't mind. Then listened to Toru about OSS at mixi.jp. Cool dude. Way cool.. :D you know how you read comics and all and you think, wow.. the japanese people are so cool. Well.. he's even cooler.. >.< Loved his style of presentation. Relaxed and walking around everywhere. I think if they have given him a clicker he might have actually walked of the stage and just talk and talk. Then went to a "Birds of A Feather" session on python. Kaeru and Bakhtiar were great. Talking about things which I haven't even heard of before.. :P Even gave me some new ideas I can try out with my projects. Programming in firefox. Sounds cool. Then end of day 1 with Pia's keynote. Almost the same as the one she gave at MyGOSSCON but with a bit of modification. Why do open source? "Fun, Work and making the world better". Great. Got me all revved up to contribute more. Then off to the speakers dinner. Great to be able to mingle with great people. But actually I was soooo tired I wasn't able to take full advantage of the opportunity. But it was fun nonetheless..
Day 2 was full of awesomeness too. I actually didn't read the schedule and thought it would start like day 1 at 9 am. But actually it was scheduled to start at 10am. I was an hour early and apiit was noisy with a taekwondo competition downstairs. Followed by James Morris talk on kiosk mode in Fedora. Looks great. Reminds me of Juzt-Reboot card which I used to have. Do whatever you want. As soon as you restart the computer is restored into it's original pristine state. Would be great to be used in computer labs at school or libraries. Then off to fosschix. Pamela Fox is so cooool.. :D There was so many people that we had to move to a bigger room. And Pamela just sat on the table talking about webdevedu. Awesome. HTML 5 and google gears was presented by Pamela. WOW!!! Can't wait for it to be properly supported by mainstream browsers. It's seriously cool stuff. I know how l33t it is to be able to do complex ajaxy stuff right now, but soon those complex ajaxy stuff have to be standard fare and html 5 will help a lot in making that come true. Alhamdullillah finally MyGOSSCON 08 is over. InsyaAllah life will soon return back to normal. It is sometimes funny that when you talk in real life, face to face, you tend to forget or leave a lot of things out because you just missed it. So when you come back from the meeting only then do you realize the things that you really wanted to say. Happened to me after dinner going back home from oscc tonight. So I just want to say it here to get it off my chest. First and foremost, I want to congratulate the superb maestro Mr. Marzuki. He has done a great job conducting the implementation of MyGOSSCON 08 from beginning to end. I was there and saw how much and how bad the problems he had to face, and even more amazingly how he overcame them with his trademark off handed coolness and kept his everlasting charm. **power** **power** /me doing the firdaus salute. Second of course a big thank you to the lovely Eavay for her excellent work in leading the development, design & maintenance of the MyGOSSCON 08 website and also for developing the plspeakers product for our intranet so that we can easily manage our speakers data. Personally I think that handling the speakers (something that I was actually officially responsible for, at least some of the speakers) has been made much easier with that product. And I think having a better infrastructure to actually work together and collaborate with in one of the primary reasons why I feel MyGOSSCON this year is a whole lot more easier than MyGOSSCON last year. Fourthly a big thank you to all the OSCC staff. It wasn't easy but finally we pulled it through, together. This thank you even includes ex OSCC staff the foss advocate extraordinaire kaeru. I can't help but think of him as I saw the awards for the OSS Case Studies given out to the winners. And thank you also Mr Firewall ;). It was tough I know. So to kaeru, kak siti, stanly, suria, Mr Jacob, Mr Foong, saro, nuhaa, cikgu, hisham, indhran, gopi, Mr Fauzi, e-jat, eric, achik, ella, kak aida, coreen and nadia, thank you all. Lastly thank you too all the speakers (especially those who I had to contact, please forgive me if I was ever rude or intruding) for their time and cooperation, thank you too to all the MAMPU staff and MEP staff who made MyGOSSCON 08 the success that it was. It was GREAT! !